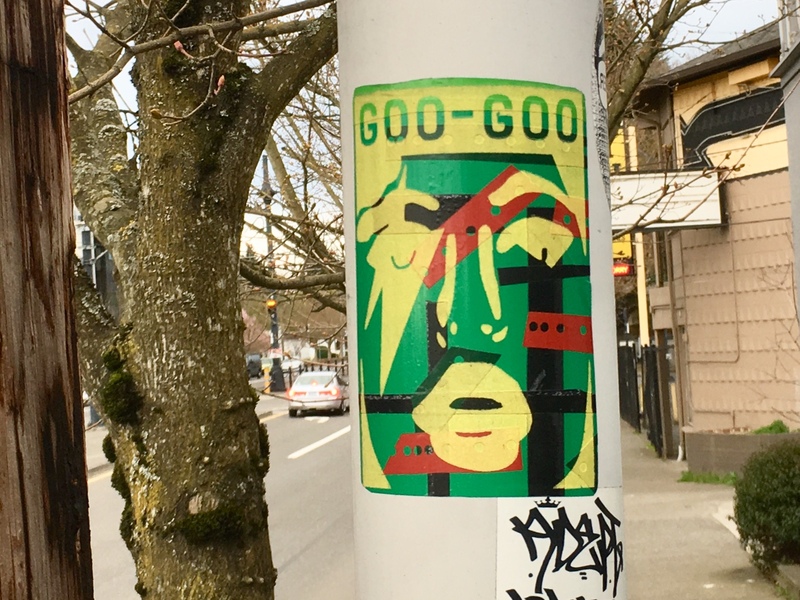 Goo-Goo won me over with prolific stickering, the use of a baby sound proclamation and an image that reminded me of KISS frontman Paul Stanley. 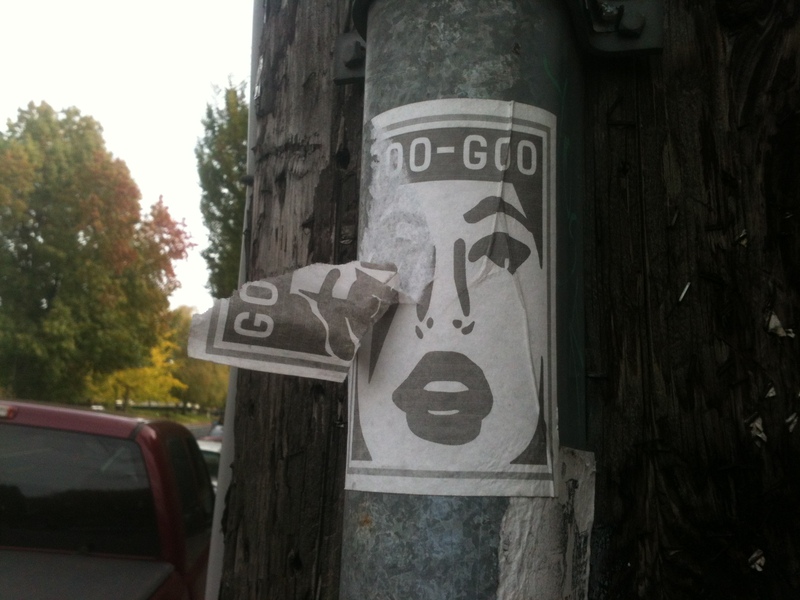 Despite Goo-Goo stickers filling me with an unexplained irrational fear of the unknown, I still need to make sense of them. I turned to a valued resource in all things counter-culture my old friend Jeff Bagato who lives in the Washington D.C. area. 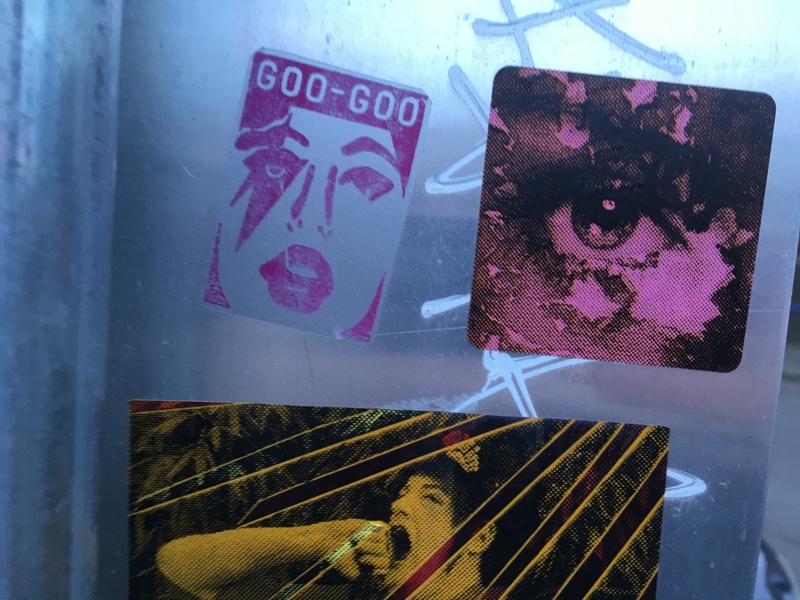 As an avant-garde artist/musician and author of poetry books and science fiction novels, Jeff is a scholar of all forms of creative expression, a category that Goo-Goo stickers fall under. “I’m assuming that Goo-Goo is a tag, but it could just be a weird phrase; both would appear on stickers,” Jeff noted by email when I queried. “I see it all the time on IG feeds. 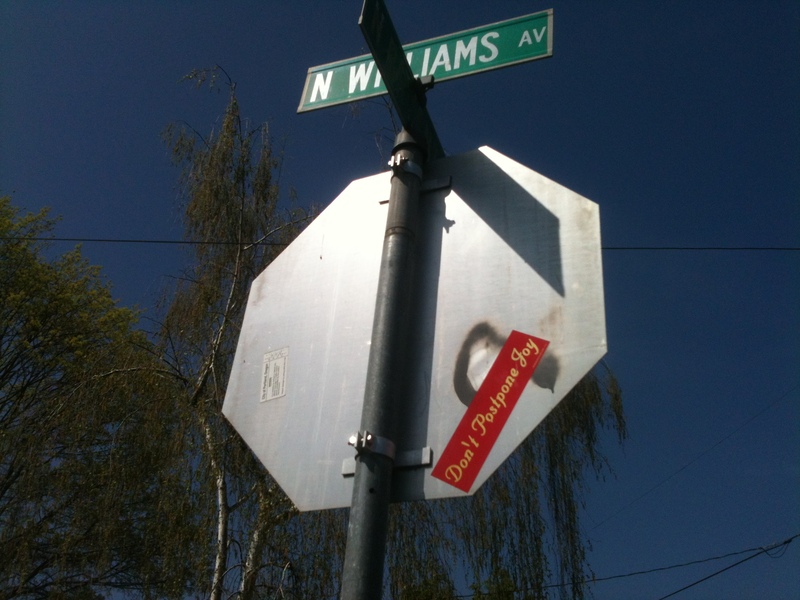 There seem to be a million sticker artists in Portland and Seattle,” he added. “Tag” and “IG,” those references left me a bit mystified but I’m playing up my ignorance for dramatic effect. The problem with getting to the bottom of a mystery means it will cease to be a mystery. Once explained my imagination won’t fill in the gaps and my interpretation will probably become invalid. I suppose that will only inspire me to search out other unexplained phenomena. 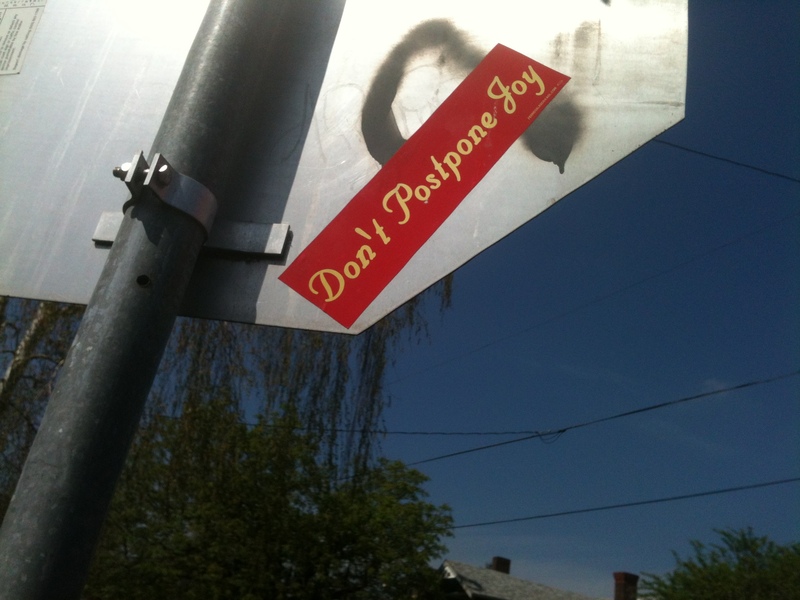 When thinking about the application of these stickers around town my mind conjures images of a shadowy figure in a Jack the Ripper cloak and wide brim hat. Why this guy, in my mind, is not trying to look less conspicuous is beyond me. I’m sure sticker art is not like that at all. 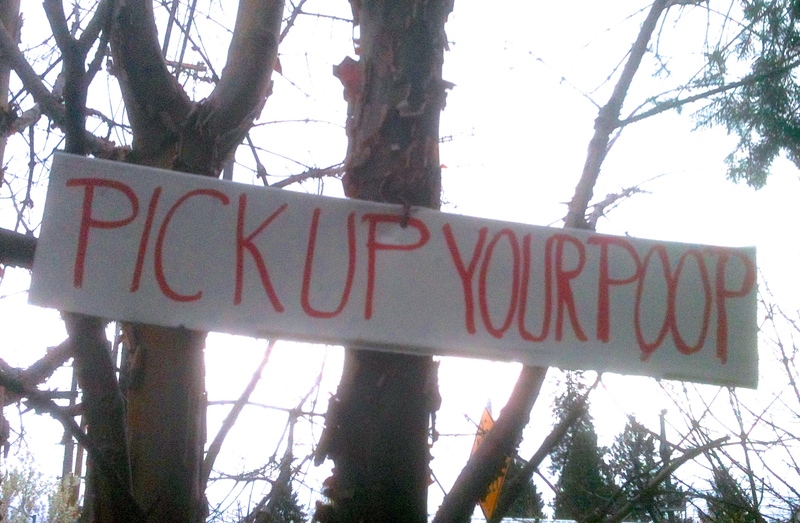 The act of disobedience by decorating the backs of traffic signs is probably duller than I realize. People are sure to be casual and not mysterious about it. The stickers caught my attention because of the variations of design, color, size and the subject matter. Their ubiquitousness helps. 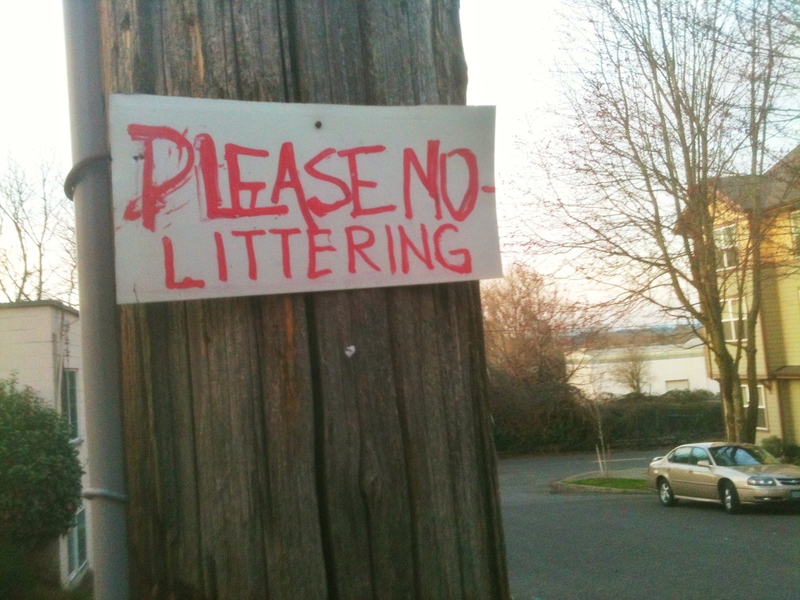 I’m partial to those in my neighborhood. 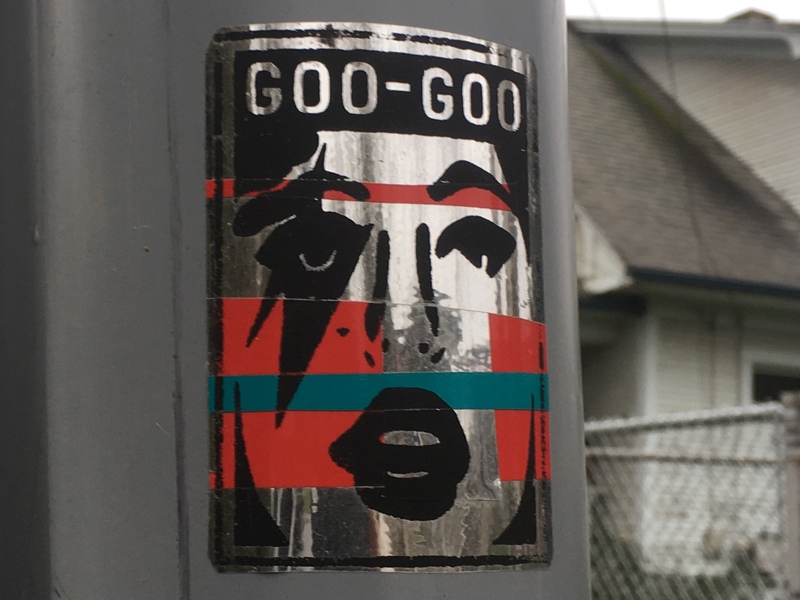 When a Goo-Goo sticker appeared close to my house it led me to think the sticker artist was clairvoyant and had caught on to my Goo-Goo obsession. Speculation on the meaning of Goo-Goo abounds. Jeff astutely commented that it’s unlikely a reference to the band the Goo Goo Dolls. To me it calls forth the beginnings of language itself, the first attempts a baby makes to speak. The great unknown is the combination of the letters and the face that I so want to believe is a homage to Paul Stanley. That the lead singer of KISS could end up as part of an underground sticker art project is something that has held my attention and kept me on the look out for more of these images. While some would could say Paul Stanley never wore his make up as it is on the sticker others might be quicker to ask: Who is Paul Stanley? 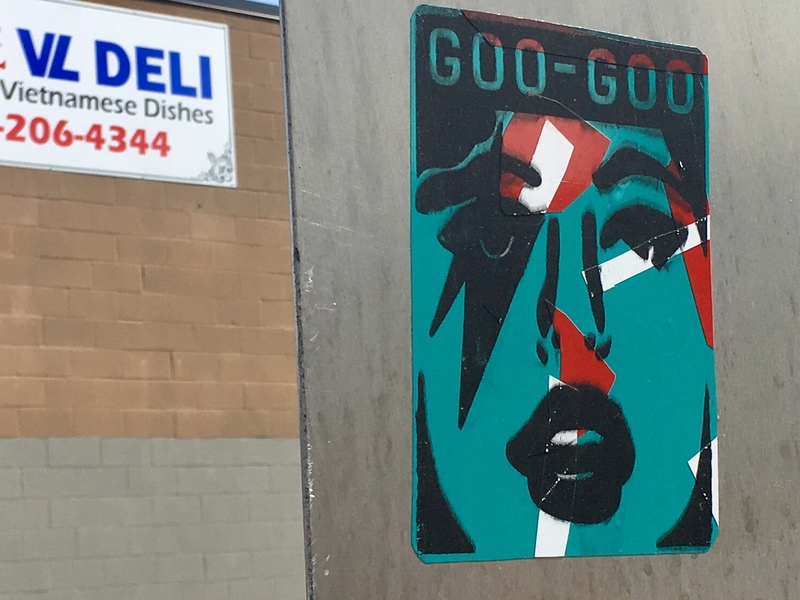 The first time I wrote about Goo-Goo was when a sticker was placed next to a piece of Bill Murray art. I used the power of my limited graphic arts abilities to remove the sticker from one of the images mainly because I didn’t like one piece of street art encroaching so hard on another. When I reached out to my friend Jeff to help me sort this out he offered an online resource to assist me in my quest to understand Goo-Goo culture. Originally I was too naive, neurotic or nervous to dig into sticker art in a way that didn’t include some support. I was afraid my mind would be blown and I knew I’d need some help putting the pieces back together. Hanging around the Cully neighborhood in northeast Portland on a recent substitute teaching assignment had me enduring minor transportation calamities in the way of two trashed/flat bike tires (thanks for helping Cat Six Cycles), discovering that a record shop called Jump Jump exists in the neighborhood and the possibility that germy kids put the kybosh on my ability to digest birthday celebration chicken wings. 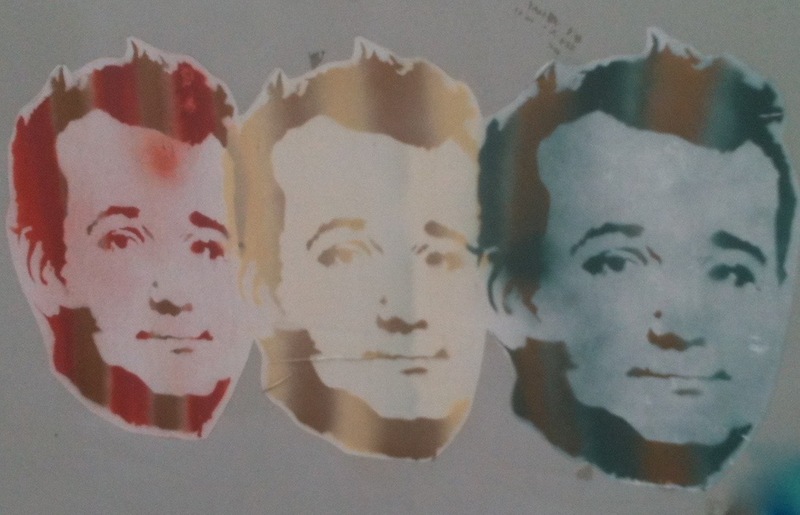 It’s all par for the course I’d have to say and finding Bill Murray’s face immortalized in artistic expression, in triplicate no less, soothed my soul and made it somehow worth it. 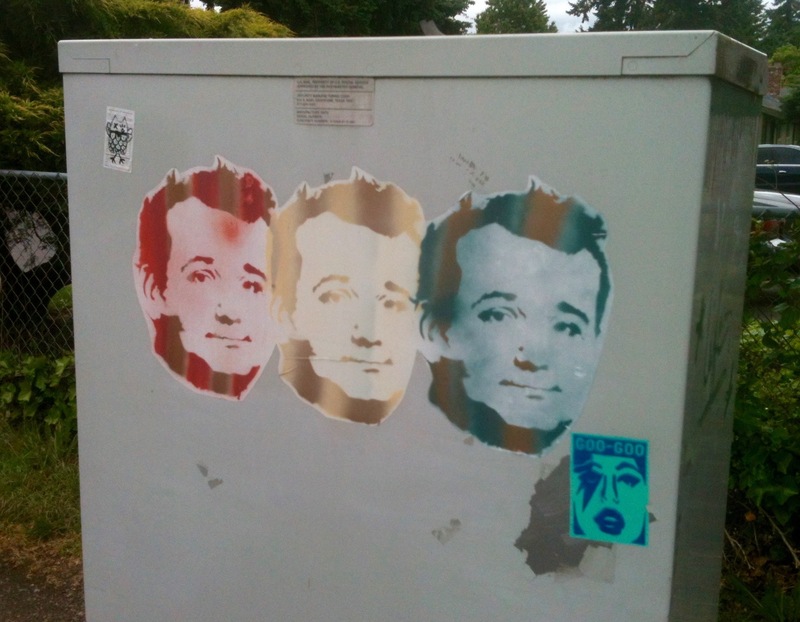 Gracing the back of an apartment mail box container on NE Prescott Ave. was the Bill Murray Triptych. Amazingly I was able ride by it the first time without stopping to genuflect. I filed this phenomenon away and returned for a photo. The image seems to come from Murray’s quintessential role in the film Stripes. The art captures Murray in all his Zen comedic charm, smirk and swagger. It has the feel of a Warhol homage in its decal, spray paint and screen print. Where Warhol created art based on one named legends like Elvis and Marilyn, this unknown artist offers passersby a portrait of a man of the people. 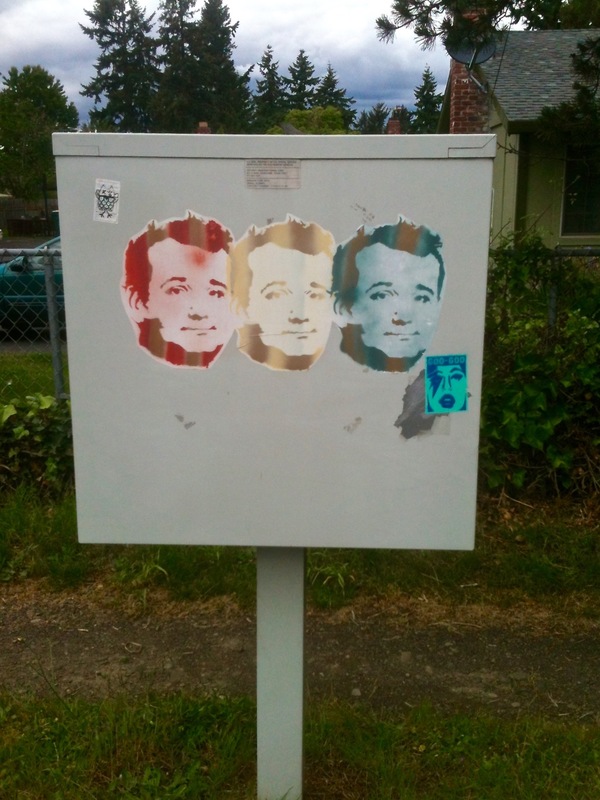 I’d be hard pressed to consider that the Postmaster General would be have a problem with apartment mailbox vandalism when one look at Bill Murray in any form makes people feel good and would cheer up even the most down and out stragglers who happen by. The work is marred only by a fellow vandal who decided to join the fray. I have no problem with the sticker, subject matter or design. 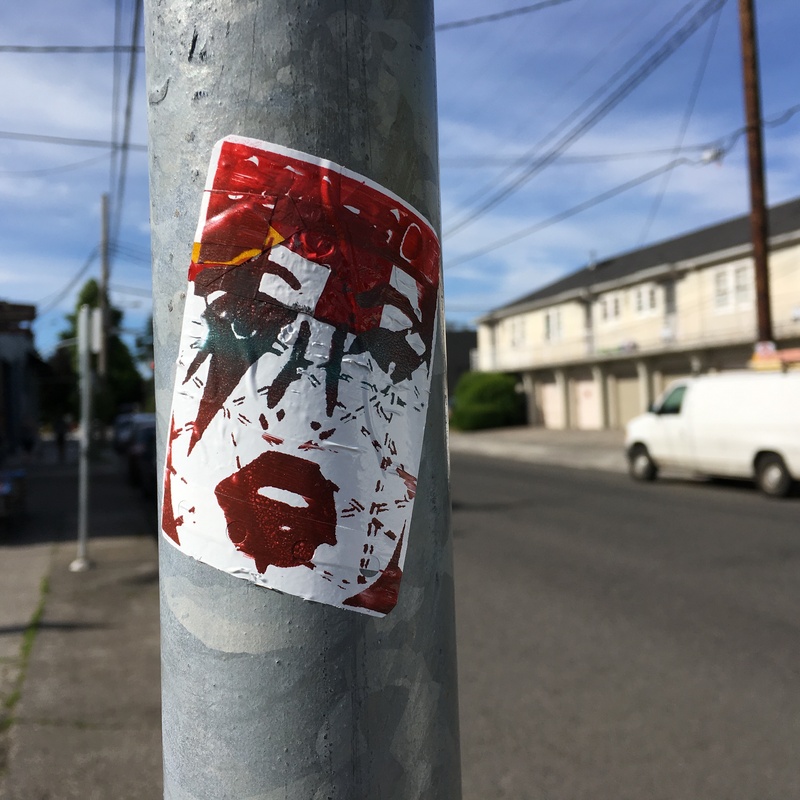 I’ve seen this sticker around and it seems a faint homage to Paul Stanley so maybe there’s a celebrity theme going on but I would have preferred to see the predominant piece of art given some space and not crowded out by a more colors and noise. Don’t mess with Bill Murray with your GOO GOO for God’s sake. A triptych is really the way to go here. One Bill Murray would not have been enough yet any more than three would have thrown the universe off balance. I’m not sure everyone in the neighborhood knows who Bill Murray is but it’s a face and artwork that with one glance returns a sense of serene, comedic calm and possibly even enlightenment. 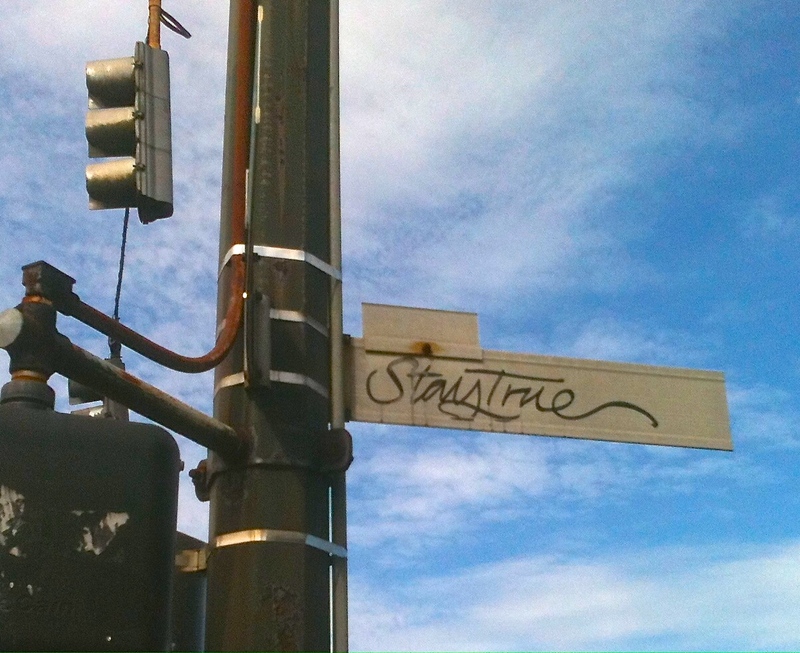 It’s a generous offering of street art, taking it out of the normal confines of the art world and exhibiting it on the side of the road where fine art is rarely seen. I can only imagine how Bill Murray figured out that he could entertain the world, but I’m glad he did. Forget your troubles, stop, and look at Bill Murray.